There is only one example in recent centuries of a private Englishman setting himself up as the ruler of an independent nation and establishing a dynasty that would rule it for a century. 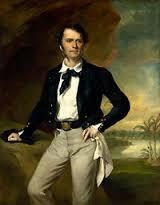 This was however the remarkable achievement of James Brooke (1803-1868), the first of the “White Rajahs” of Sarawak. My interest in him was aroused, not only by his appearance in “Flashman’s Lady” by George MacDonald-Fraser, but my own visits to Sarawak, the most recent being in 2014. 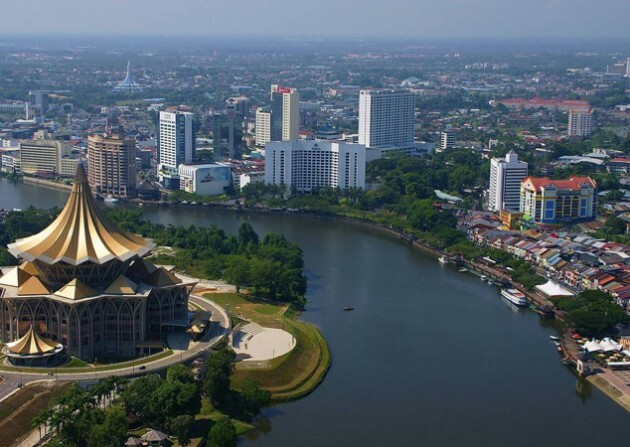 Sarawak, is the portion of the nation of Malaysia that lies on the north coast of Borneo. It stretches some 450 miles, roughly south-west to north-east, bordered northwards by its long coast along the South China Sea and southwards by its frontier with Kalimantan, the larger part of Borneo that belongs to Indonesia and to the north east by the independent sultanate of Brunei. 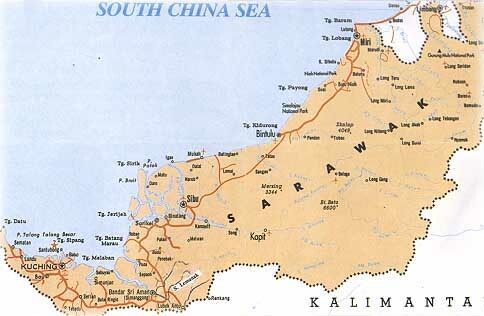 With an area of some 48,000 square miles (compared with Great Britain’s 88,000) and a population of 2.4 million, Sarawak today is a highly-developed modern state with a thriving economy based on development of large gas and oil reserves and responsible use of the government revenues that accrue. Sarawak’s population is mixed as regards ethnicity and religion. Some 30% of the population are Ibans – a term that covers many sub-groups – who were the original inhabitants of Borneo and are today mainly Christian. At 24% The Chinese community is the next most populous group, Chinese pioneers having come here as long ago as the 6th Century AD, but their major immigration occurring in the last century and a half. Malays represent 23% of the population, their presence going back upwards of a thousand years and the large majority of whom are Muslim. The remaining 23% are made up of a huge multiplicity of indigenous ethnic groups, many of them Christian, plus Indians and Europeans. Somehow, it all works reasonably well and sets an example for so much of the rest of the world to follow as regards acceptance of diversity, mutual respect, and focus on common goals of peace and development. Born in India in 1803, son of a British judge, Brooke was sent to England at the age of 12 to be educated, a process punctuated by running away from a school he disliked. He returned to India at the age of 16 and was commissioned into the Bengal Army of the British East India Company. (In this period there was no direct British rule, nor was there to be for another thirty years, and the Company had its own army). The First Burmese War broke out in 1824 and Brooke was soon in action with a body of volunteer Indian horsemen he had trained. He was to lead them in a successful charge at the Battle of Rungpore in January 1825 and two days later repeated the exploit. This time however he was shot in the lung. Thrown from his horse, he was left for dead, and only when the battlefield was cleared was he found to be still breathing. He survived, but even after his initial recovery was weak enough to be sent back to Britain to recuperate. His wound was sufficient to justify a pension of £70 per year for life. 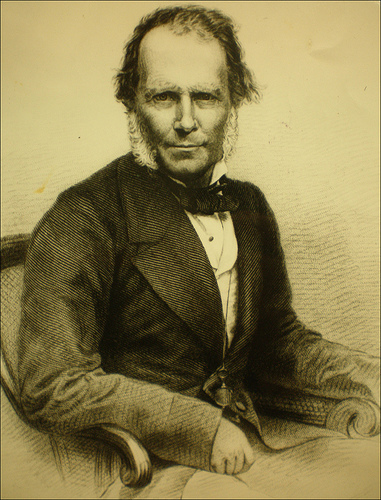 The next five years, marked by continuing ill health, were spent in England and when he returned to India in 1830 he resigned his commission. Fascinated by South East and East Asia, he sailed on to China – more illness there – and back to England. Once at home again, Brooke began to read widely on the East and to consolidate the negative opinion he had formed of the East India Company (known as “John Company”) and the stranglehold it maintained on commercial activity. He did not share the prejudice of so many of his class against “trade” and he recognised significant opportunities in South East Asia. Drawing on family money, Brooke purchased a “rakish-looking slaver brig,” the 290 tons Findlay, loaded it with trade goods, hired a crew and master and took her to Macao, the Portuguese colony on the China coast. The venture was a financial disaster and Brooke returned home much chastened. 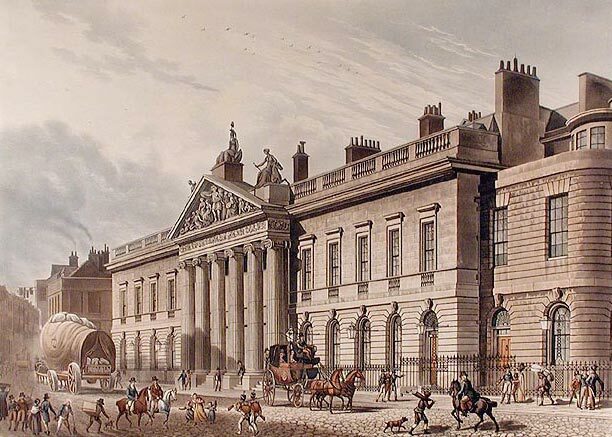 He bought a small yacht and sailed it off Britain to increase his knowledge of seamanship – which he should probably have done to start with – and the death of his father in 1835 brought him an inheritance of £30,000, a vast sum at the time. Now 33, Brooke realised that it was now or never if he was to realise his dreams. He bought a 142 ton schooner, the Royalist, and set systematically about learning all he could about Borneo, which he had identified as offering the greatest opportunities. There was a Dutch presence on the south of the island, but the Malay Sultanate of Brunei, on the north coast, had been weakened by corruption and extortion and had only limited control of its territories. Oppression of the Iban tribes by the Malay rulers was extreme and there was widespread resentment. 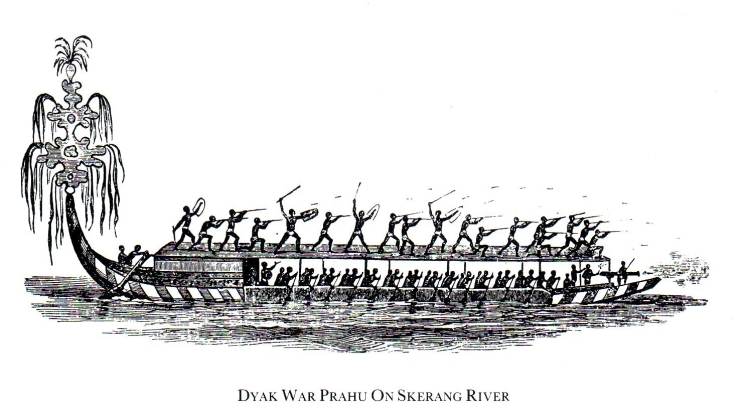 Loose control led to flourishing piracy, the most important participants being “Illanuns” from Mindinao in the Southern Philippines, as well as indigenous groups known as the “Sea Dyaks”. 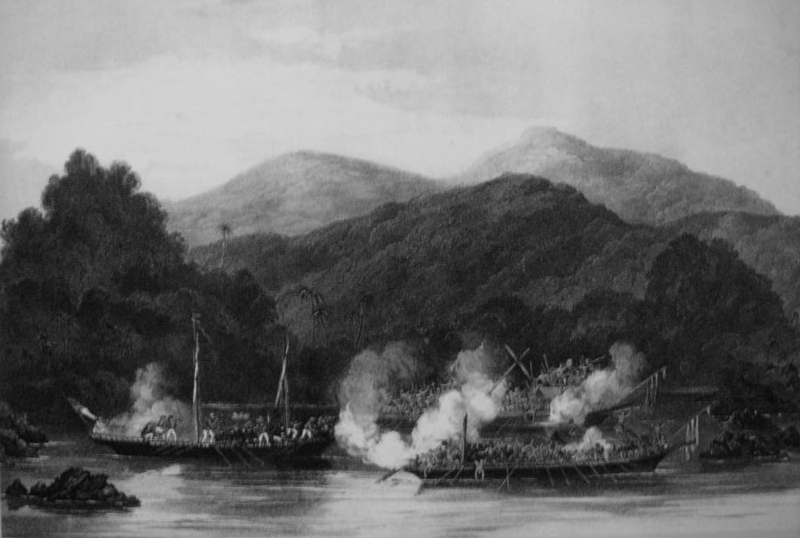 Borneo’s estuaries provided ideal hiding places and the pirates tended to victimise Chinese traders and to avoid European shipping. If trade was sparse then the pirates moved inland, along the rivers, to raid the tribes living there. It might be added that headhunting was a widespread and honoured tradition at this period. Pirate activity was again taking off however, leading to the largest punitive expedition of all. 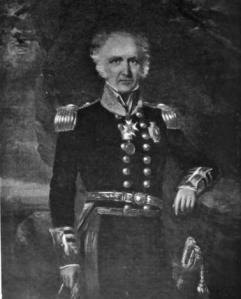 On this occasion Brook had the support of Admiral Sir Francis Collier with HMS Albatross (16-gun brig) and the East India Company screw gunboat Nemesis. Once again a drive upriver was required – for this Albatross had too deep a draught, but she provided her longboats – and Brooke brought some sixty “praus” – local craft – carrying a large force. In the battle that followed the pirate force was isolated on a sandspit and was lashed by fire from Nemesis. The prahus cut off escape and the battle raged for five hours under a bright moon. Brooke’s local allies showed no mercy to those who had persecuted them so long. An attempt was made to board Nemesis but the attackers’ canoes were overturned and many of their occupants battered under her paddle wheels. 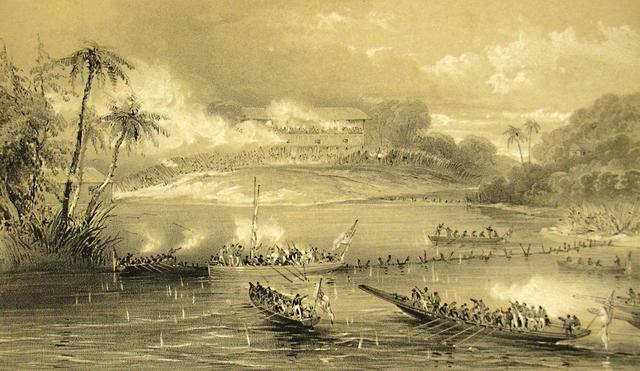 After losing nearly a hundred boats and 500 men, the pirates’ main force, some 2000 strong, managed to escape upriver, losing 500 in the process. Brooke refrained from following and in the weeks thereafter the pirate groups surrendered. The 1850s were years of consolidation and Brooke established a small but capable civil service. Trade grew slowly, although there were further outbreaks of violence to be suppressed, including a revolt by part of the Chinese community. Brooke was reluctant to allow European traders to operate freely as he believed that this would result in exploitation of the inhabitants. Much trouble was caused by a trader called Robert Burns, apparently a grandson of the Scottish poet and described as “disreputable”. He was accused not only of stealing women but of encouraging local tribes to kill anybody trying to enter his areas of operations. 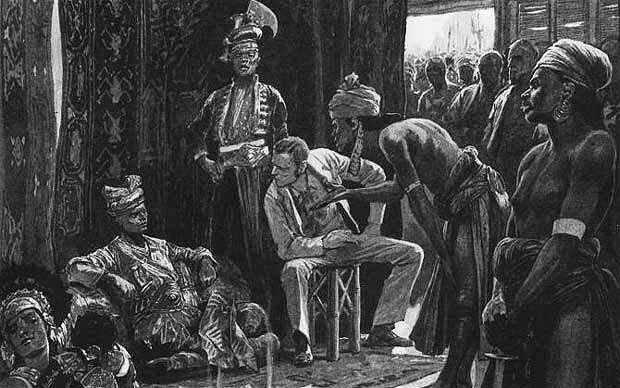 Expelled from Sarawak, Burns was to turn to arms trading off North Borneo. Here he literally lost his head after his ship was attacked by pirates. Brooke accompanied the Royal Navy commander in the area, Admiral Sir Francis Austen, on an expedition to punish those responsible. This resulted in the unlikely circumstance of the novelist Jane Austen’s brother avenging the grandson of Robert Burns. In these years Brooke invited the naturalist Alfred Russel Wallace to Sarawak. This encouraged Wallace to decide on the Malay Archipelago for his next expedition, one that lasted for eight years and established him as one of the foremost Victorian intellectuals and naturalists of the time. 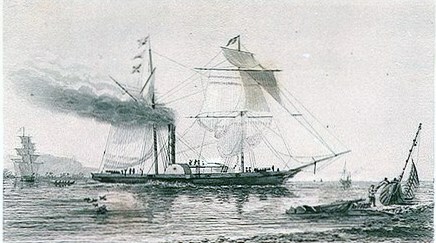 Brooke became the centre of controversy in 1851 when accusations against him of excessive use of force, under the guise of anti-piracy operations, ultimately led to the appointment of a Commission of Inquiry in Singapore in 1854. After investigation, the Commission dismissed the charges but the accusations continued to haunt him in his later years. One of Vyner Brookes’ daughters married into the Halsey family, the same family that produced Jellicoe’s Captain of the Fleet (later Admiral Sir Lionel Halsey, who was also the first captain of the battle cruiser HMS New Zealand and Admiral of the Royal Australian Navy) and – more distantly – Admiral ‘Bull’ Halsey USN.